There's something about Guinea - its natural fertility perhaps - that makes people want to get back to the land. Not me, so much, but other people. My housing compound has already been functioning as an agricultural co-op; we have avocado, papaya, mango, and coconut trees on the premises, and periodically the gardeners will come around with armfuls of fruit for each of us, harvested from our very own trees. 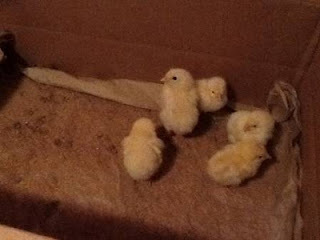 But my next-door neighbor Ricky* wanted to take the next step in his quest to become a gentleman farmer, so with the approval of the Homeowners' Association (the four of us who live there), he has decided to raise chickens. After months of tooling around with chicken wire and locating a source of high-quality poultry from approved bloodlines, the compound has now welcomed its newest residents. ﻿﻿﻿﻿Other embassy wannabe chicken farmers have not had very good luck with their pullet pursuits. Their fowl have gotten sick or wandered off or fallen victim to various marauding carnivores, but Ricky is determined to beat the odds. I'm less optimistic, but it would be nice to have a steady source of super-fresh eggs in the event that they do make it to maturity. In the pioneer bartering spirit, I'll trade desserts for eggs. Cardamom molten chocolate cakes perhaps. ** Yes, those are really their names. Not mine. I took the batteries out years ago.